Students recognise the centrality of ‘country’ in shaping Aboriginal and Torres Strait Islander identities. View the video clip and discuss the themes and styles of the paintings. How is the centrality of country to the identity of indigenous people shown in the paintings? Try to explain the connection between the land and indigenous culture or way of life. Encourage students to visit an indigenous art gallery and/or to use other sources to examine a range of indigenous art. 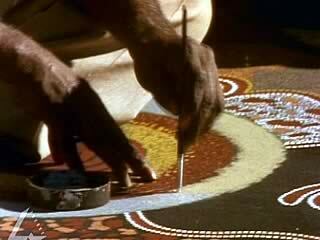 Go to Images of Aboriginal Art for many examples. Investigate what appears to be some central ideas running through many of the indigenous art works. It is sometimes said that ‘indigenous art is like a topographic mapping of their land and culture’. Thinking about the video clip and other sources what do you think this means? Invite a member of the indigenous community and/or a indigenous art gallery owner to class to show and discuss indigenous art. Or go to Home and the Warlpiri People – Audio Interview with Aboriginal Artist Malcolm Jagamarahttp for an insight into how country and place shapes Aboriginal culture and art. Rosemary Kowanko, Aboriginal Art and the Dreaming, Curriculum Resources, South Australia, 1994. Go to Aboriginal Art and Culture Centre for more information about the Aborigines concept of Country, the Dreaming and their art. Got to Aboriginal Art Store Art History & Culture Podcasts for more discussions by Aboriginal artists their art.